NSF/CISE IIS – “Cyber-Human Systems (CHS): Large: Collaborative Research: Pervasive Data Ethics for Computational Research (PERVADE)”. Study how diverse stakeholders – big data researchers, platforms, regulators, and user communities – understand their ethical obligations and choices related to computational research that relies on big, pervasive datasets about people. UMD will hold a workshop to create the building blocks of a Master’s level educational curriculum to educate the next generation of librarians and archivists in the computational treatments of collections. Project outputs will include a framework for creating curricula and lesson plans, open access tools for institutions to deliver this type of educational program, and a community development plan to seed future collaboration in this area. UMD, with the DCIC as a collaborator (Richard Marciano and Bill Underwood), will partner with the WHCA to create a digitized Presidential Press Pool Archives. WHCA Board unanimously voted to partner with UMD (Journalism, Libraries, iSchool) and the Newseum. The UMD iSchool DCIC Center (in partnership with the Maryland State Archives, The National Archives in the UK, and King’s College London) was awarded a 1-year International Research Networking grant for UK-US Collaborations in Digital Scholarship in Cultural Institutions (Feb. 1, 2019 to Jan. 31, 2020). Funded by the Arts and Humanities Research Council (AHRC) of the UK, this major new transatlantic program responds to the technological shift taking place in cultural organizations and explores how collections can be made available in digital form for large-scale computational research. The goal is to open new research frontiers and questions and advance collections-based research methods for the 21st century. A CIC Big-10 $10.5M NSF/DIBBS-funded collaboration with the University of Illinois NCSA Supercomputing center and industry partners (NetApp and Archive Analytics Solutions). This project aims to help accelerate the development of digital curation processes and services and create a data observatory to provide access to Big Records training sets and teach students practical digital curation skills. 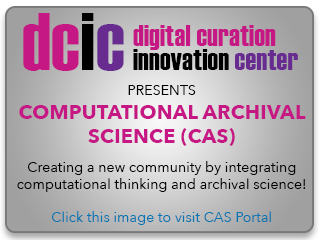 A $300K IMLS-funded project that helped develop and launch online professional education for digital curation professionals, and is also developing as an open-source research and education platform, the VCL (virtual computing lab), to remove barriers to access for curation tools and resources. The DCIC will research, develop, and test software architectures to improve the performance and scalability of the Fedora repository. This project will create a new Fedora implementation without current performance bottlenecks relating to storage size, enabling institutions to manage Fedora repositories with petabyte-scale collections. It will apply the new Fedora 5 (API) to a repository software stack called DRASTIC. Fedora community partners will be engaged to help develop use cases and performance expectations. The project will produce open source software, tested system configurations, documentation, and best-practice guides. Drexel University will develop the Library Education And Data Science (LEADS) program, a transformative doctoral training initiative grounded in library science foundations and integrating a new data science focus. The program will provide stipends for 18 library school doctoral students across the country. These LEADS Fellows will complete an online preparatory curriculum, an intensive 3-day data science boot camp at Drexel University, and a ten-week data science internship with a LEADS project partner in which the students will complete data science activities in a real-world library setting while conducting original research. The program will result in a cohort of future faculty members who can bring data science knowledge and skills into library graduate schools across the country. The chief outcome of the program will be a proven template for educating library data scientists, while also readying this first cohort to serve as educators and leaders in libraries and archives.